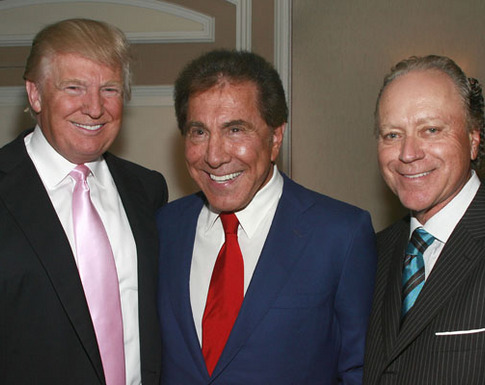 Business tycoons Steve Wynn and Donald Trump have a lot in common. They both made fortunes in the casino and real estate business, both attended the University of Pennsylvania, and both have struggled identifying with one political party throughout their tenures as billionaires. And now they have yet another common bond, in that they both hope Trump wins the 2016 GOP nomination and ultimately becomes the 45th president of the United States. According to the Fox Business Network (FBN), Wynn is serving as an unofficial campaign advisor to the ever-blunt 2016 GOP frontrunner, and his influence was reportedly made known this week after Trump finally signed a deal with the Republican Party asserting he wouldn’t run as a third-party candidate. The first item of business for Wynn, 73, was to convince Trump, 69, to sign the Republican National Committee’s “loyalty pledge” and rule out an independent party run, something he’s refused to commit to in the past, including at the first GOP debate. On Thursday, the Donald announced he wouldn’t run, unless on the GOP ticket. Trump’s signing of the oath might add fuel to his already hot campaign fire, assuring many weary Republican voters, whose main goal is to block Hillary Clinton from inhabiting 1600 Pennsylvania Avenue, that supporting him isn’t an all-in move. Trump and Wynn’s partnership isn’t a complete surprise, though the two certainly haven’t always been buddy-buddy. But Wynn and Trump have long-since repaired their relationship. Consulting Wynn for campaign advice certainly goes with the norm of the Donald doing things a little differently than most presidential hopefuls, such as conferring with businessmen over political operatives. He hasn’t hired any former presidential campaign advisors, and according to the polls, he doesn’t need them. On the national level, Trump has a commanding 14-point lead over his nearest rival, one more non-politician in neurosurgeon Dr. Ben Carson.